Today is posting day for the monthly Daring Bakers challenge, and I’m live blogging the challenge. This month our hosts Shel of Musings from the Fish Bowl and Natalie of Gluten A Go Go chose an alternative challenge for us: vegan and/or gluten-free lavash crackers from Peter Reinhart’s The Bread Baker’s Apprentice with vegan and gluten-free dips. Because crackers and dips are a match made in heaven, the challenge calls for both. 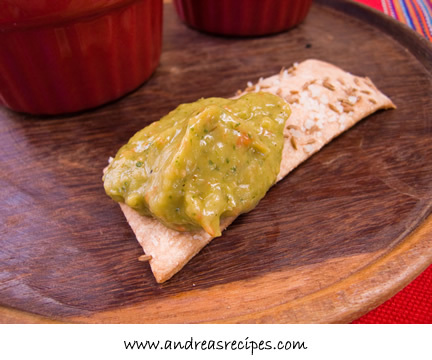 I chose to make a roasted tomatillo jalapeno and avocado salsa using the fresh tomatillos and jalapenos from our garden. 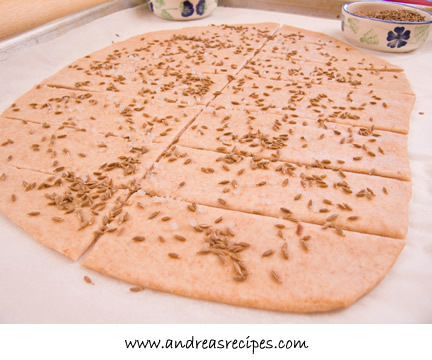 The flavors worked perfectly with the cumin seed lavash, and it’s a combination we will certainly make again. I chose to make two batches of lavash, one according to the challenge instructions and the other with a 50-50 mix of bread flour and whole wheat flour. Of the two, we preferred the flavor of the whole wheat lavash. The house is a little cool today, so I’ve put them in the oven with the light on. They will rise for about 90 minutes. The recipe calls for 60 to 90 minutes, but I anticipate needing the full rising time due to the weather. These will top the crackers. 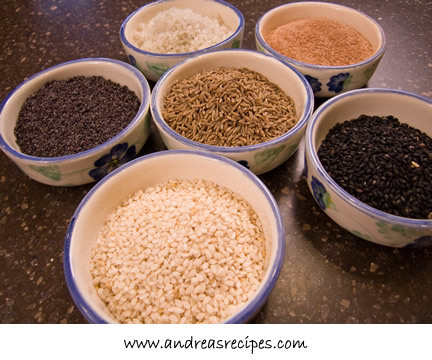 Clockwise from the top: coarse sea salt, cinnamon sugar, black sesame seeds, white sesame seeds, poppy seeds, (center) cumin seeds. A big thanks to Shel of Musings from the Fish Bowl and Natalie of Gluten A Go Go for choosing our delicious and fun challenge! To see all of the crispy lavash, visit The Daring Bakers Blogroll. 1-1/2 cups (6.75 oz) unbleached bread flour or gluten free flour blend (If you use a blend without xanthan gum, add 1 tsp xanthan or guar gum to the recipe.) I used a 50-50 mix of unbleached bread flour and whole wheat flour. 2. 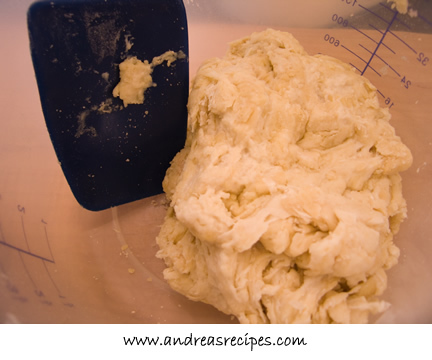 Sprinkle some flour on the counter and transfer the dough to the counter. Knead for about 10 minutes, or until the ingredients are evenly distributed. The dough should pass the windowpane test (see http://www.wikihow.com/Determine-if-Bre … ong-Enough for a description of this) and register 77 degrees to 81 degrees Fahrenheit. The dough should be firmer than French bread dough, but not quite as firm as bagel dough (what I call medium-firm dough), satiny to the touch, not tacky, and supple enough to stretch when pulled. 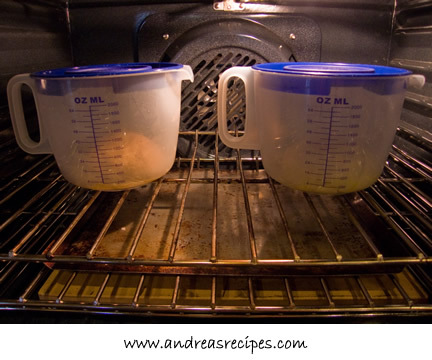 Lightly oil a bowl and transfer the dough to the bowl, rolling it around to coat it with oil. Cover the bowl with plastic wrap. 6. 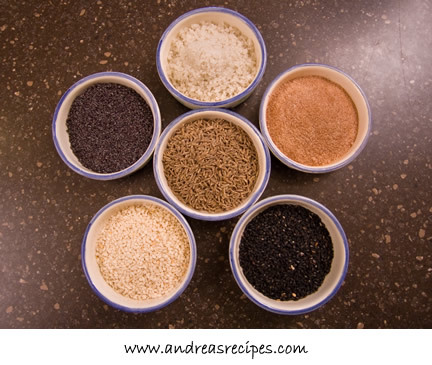 Bake for 15 to 20 minutes, or until the crackers begin to brown evenly across the top. 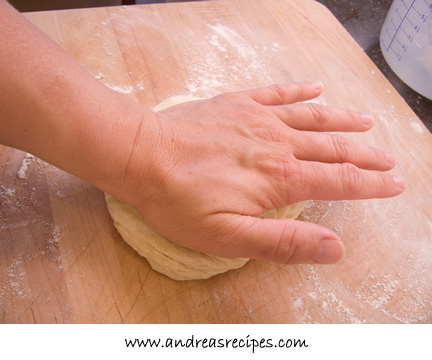 The time will depend on how thinly and evenly you rolled the dough). Mine took a little longer. 2. The dough should be firmer than French bread dough, but not quite as firm as bagel dough (what I call medium-firm dough), and slightly tacky. 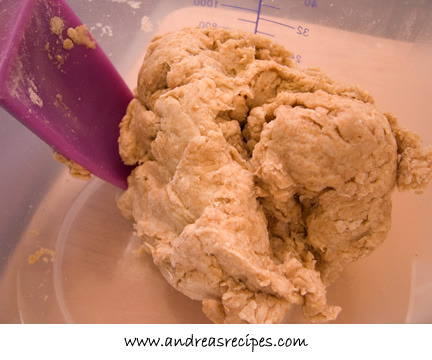 Lightly oil a bowl and transfer the dough to the bowl, rolling it around to coat it with oil. Cover the bowl with plastic wrap. 4. Lay out two sheets of parchment paper. 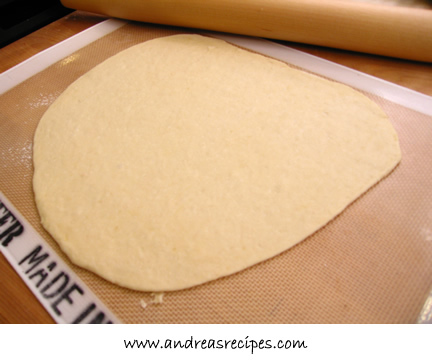 Divide the cracker dough in half and then sandwich the dough between the two sheets of parchment. 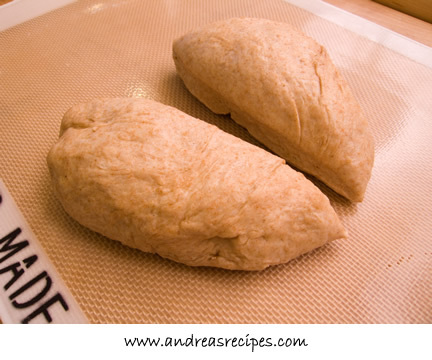 Roll out the dough until it is a paper thin sheet about 15 inches by 12 inches. Slowly peel away the top layer of parchment paper. 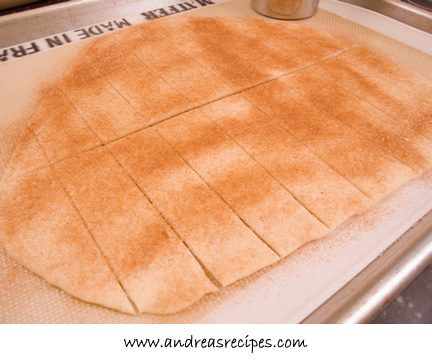 Then set the bottom layer of parchment paper with the cracker dough on it onto a baking sheet. I love the live blogging. How fun. Makes me want to run to the kitchen and make them with you. 🙂 I’ll stay tuned through out the time to see your crackers. “The house is a little cool today,”… You have no idea how much I’d love to be able to type those words. Here in Central Texas it was cool(er) outside this morning – mid 60s. Already climbed twenty degrees however and it isn’t noon yet. Have fun with the lavash. We enjoyed that for the first time on vacation in Hawaii years go. It is just the ticket for dips and I look forward to reading all your recipes. This is a great post! I’m so glad you liked the challenge! You did a great job! Shellyfishs last blog post..I’m just crackers for the Inaugural “Alternative” Daring Bakers Challenge! Live blogging! You gotta love it! 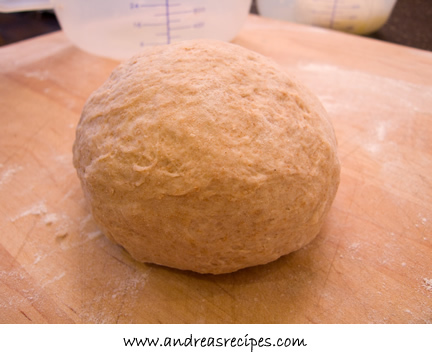 My house was cool the day I baked and the dough took forever to rise, husband and I were rolling out dough at 10 pm…. Stubborn me refused to let the oven help rising. Baking Sodas last blog post..Daring Bakers September: a shattering challenge! Oh how cool! It’s like watching a really good baking movie! Hope your crackers turn out great! Ivonnes last blog post..And She Burns her Crackers! what a great job you did and the step by step photos are fantastic! Arans last blog post..A Gluten Free Daring Bakers… and a "Laster Arte"
Live blogging –fun! But when you’re cooking that’s a whole lotta hand washing to be able to type without ruining your keyboard. Looking forward to seeing the finished product! Great job! 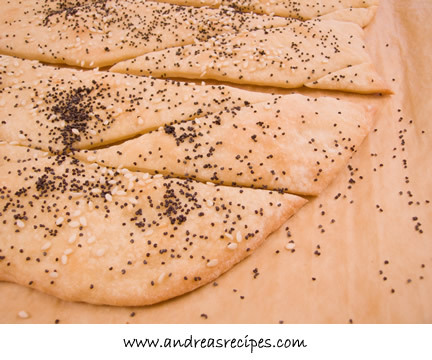 Your Lavash Crackers are perfect! Everything looks delicious! 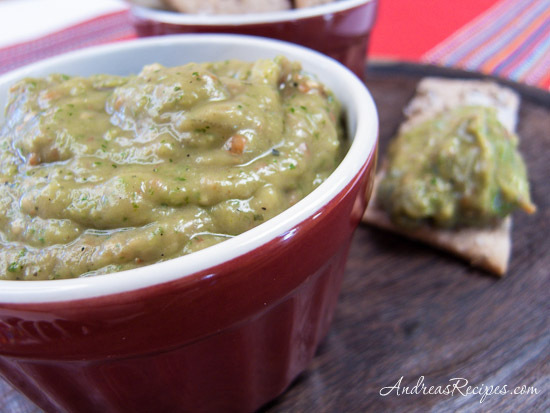 Andrea I’m holding my breath for this roasted tomatillo jalapeno salsa with avocado dip! Wow! I can’t get all the goodies from my garden but oh does that look and sound wonderful! What a great way to walk through the process! I’m envious of your even and crispy lavash – mine was a little thicker than probably wise…ah well. An excuse to make it again! Very nice! That guacamole is a perfect touch for these. And thanks again for the “posting live” idea. I’d like to try it some time! 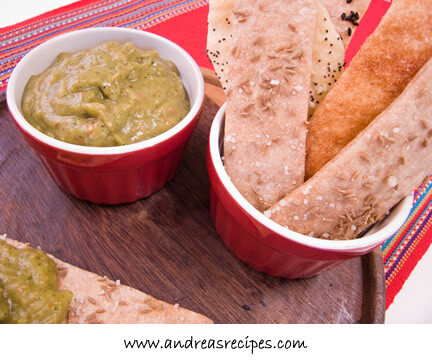 The dips sound divine – I have never had a tomatillo, I never see them here . Great job on the crackers – wonderful step-by-step photos. YUM – I am inspired. Love that you used different seeds for different batches of crackers, plus the batch with part whole wheat…a whole lotta great crackers to go with that yummy spread. Looks yummy Andrea. Love the lavash & am envious, read very, of the dips made with fresh stuff from your garden. Superb! I’m late to the live-blogging party but your finished products are marvelous! Wow Andrea I love the step by step photos. Lovely idea to be live blogging it! cocos last blog post..A year of blogging and Nutella cupcakes! Great step by step instructions! Your dip sounds yummy! Great job, Andrea. I loved this recipe, and want to try the half whole wheat flour like you did next time. Sounds yummy. Well, I’m in hot water. I forgot all about this month’s DB challenge, and it looks like one I would’ve enjoyed recreating. Not to mention eating, if your wonderful pictures are any indication. Andrea, yours look especially good supporting that wonderfully spicy salsa. Marysols last blog post..Coconut Macaroons. Oh, Mother of Science, what’ll they think of next? Wonderful job on these! Your dip sounds especially delicious. Hmm – this looks great, but this is not lavash as I know it. Which is not to say that there’s no kind of lavash that looks like what you made – but the lavash I grew up with in Azerbaijan is very thin, very soft and pliable tortilla-like bread (but much thinner) – it’s almost paper thin, and is used exclusively for wraps. I actually was going to make some today, though myself I have trouble rolling it out to adequate thinness. Sofya, I am looking for a “soft” lavash recipe, would you consider sending one, so far every one I have seen is for Lavash crackers, which look great but they just aren’t want I’m looking for. You could email me if you like.